Interview with Krishan Bheenick (CTA) – KM, systems thinking and the backlash of knowledge sharing | Agile KM for me… and you? Following the global consultation of CIARD (Coherence in Information about Agricultural Research for Development) in May 2013, I had the pleasure of meeting Krishan Bheenick, Senior programme coordinator knowledge management at CTA (Technical Centre for Agricultural and Rural Cooperation) on his take about KM and where it’s headed. What is your personal story with KM? I am not an expert in KM. My background is in agricultural science and in simulation / modeling. 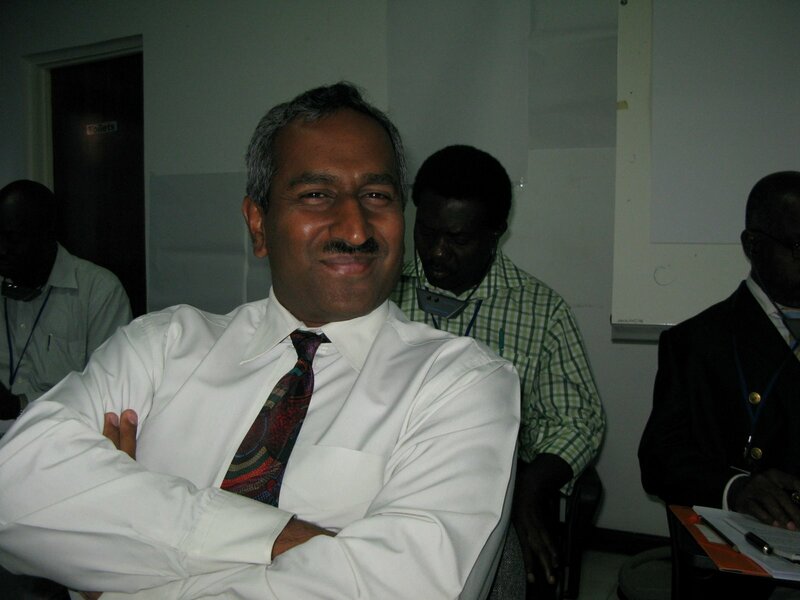 I used to teach at the University of Mauritius. These experiences helped me, forced me to have a holistic approach. I left the world of academia and wanted to get closer to policy-makers to have more influence. I landed in the field of conceptualizing information systems – following the systems approach which I’m now transposing to information science – at national level. I developed a proposal for a national information system in Mauritius, vetted by FAO’s Investment Centre, but which was never financed. After that I ended up working at SADC (the Southern African Development Community) where I was asked to facilitate capacity strengthening in information management at regional level. What is required at national and at regional level brings up this systems approach: What works at regional level can be adapted at national level. Technology itself is just a way to implement information flows across the scale. That’s the baggage I came with at CTA. The focus of CTA is to build capacity in information, communication and knowledge management (ICKM). I feel comfortable with that but my position mentions ‘knowledge management’ while I have a lot of questions about KM. I don’t mind this challenge because it forces me to go beyond what I’ve worked with the last years and to differentiate what is KM as opposed to what we used to do in information and communication management. How is KM conceptualized and implemented in CTA? KM at CTA is about how ICKM is interrelated. We started using ‘ICKM’ in the SADC region when thinking about developing regional info systems. During one of our regional workshops, we compared what is a communication strategy, an information management (IM) strategy and a knowledge management strategy. We realized that they’re all interrelated and intertwined and there are different entry points to ICKM. I try and help people define that entry point to the process – even if they don’t know much about it – and to ensure they have some components to help improve the implementation of the communication strategy, strengthen information systems through an information management strategy and ultimately aim at developing a KM strategy focusing on these two elements. At the same time, it’s important to get policy-makers to realize that even though they don’t call some procedures, processes, policies as KM they are practicing it. One of the motivating factors (and selling points to drive the process) is to get them to realize that they’re already putting KM into practice. That is currently more or less the CTA perspective. In terms of interventions, our approach at CTA has been to tackle interventions in ICKM at whatever level the request is coming from e.g. groups of policy-makers who would like to have a web space for discussion, developing a simple website including some collaborative networking functions and forums (e.g. as simple as Dgroups). Whatever the request, we respond to it as it’s been put to us, in order to get engagement in the process. Then we follow up with sensitization to the whole spectrum of ICKM. Some organisations would like to recognize the need to develop a strategy (whether on communication, information or knowledge management). CTA can help. We are running some pilots in ICM strategy development. My colleague in KM at CTA, Chris Addison, has been working with farmer organisations who wanted platforms for collaboration. We’ve been working with communication officers to help communicate among sub-regional farmer organisations under the umbrella of one regional block. Chris and I are addressing the needs for KM applying two different approaches, one from a mechanistic perspective back up and the other from the strategic perspective all the way down to technical. In the end we hope to come up with a framework that links strategic with technical aspects of KM. That’s the process we’re interested in and also discovering what KM is all about. I don’t know enough about KM to say I’m an expert. I’m a learner, I understand some principles and I apply these principles in my job to respond to requests. Where are your current interests and next steps with KM at CTA? There’s a lot of talk about knowledge sharing (KS) and when people talk about KM a lot of illustrations come from KS. But is KS by itself sufficient to represent KM? I feel that the community is talking less and less about IM because we’ve started getting interested by the process. Has KS replaced IM? Are we, while focusing on KS, distracting ourselves away from KM perspectives – where KM is left to a very intra-organisational approach? The very active promotion of KS approaches makes people think that it’s the same as KM. It’s time to remind ourselves how KM is applied at a larger perspective than organizational e.g. community-wide. It’s my wish to explore that with colleagues in the KM field. It’s my wish to explore that with colleagues in the KM field. Where do you think the field of KM is headed and how do you look at it? My wish would be to see that KM takes a step back for a better overview, revisits what’s been done in the field of KS where a lot of people are equating KS with KM. We should not lose the red thread. It’s important to show how KS is effective for KM but it’s not necessarily addressing management aspects. We’re not able to capture the essence of how KS is operating in KM. What is the feedback that you get from KS: is that the whole of KM or KS in duplex? How is the duplex KS ending up becoming KM? The principle of KM about documentation, reflection and sharing reflection and building upon previous reflection is to me a good KM practice. We can’t all keep sharing our thoughts and we need sometimes to stop, take stock, learn and acknowledge what we’ve learnt and put those out as resources, which is where I appreciate what the KM4Dev community does with the KM4Dev wiki (although if I looked closely at that I might offer a critique of it). Now that we have a KM scan ready to be applied. We’ll test it at small scale and if it works at that scale we’d like to share it with more people so that we get an instrument that is robust enough to take our snapshots of KM in the organization. What networks, publications, resources would you recommend discovering to know more about what matters (to you) in KM? Ark KM published a very expensive book last year ‘KM in organisations’. The Table of Contents was available and when I read that I realized that our thoughts about the state of KM in Agricultural & Rural Development, during a consultation last year, were very well reflected in that book. I would love to see whether CTA could approach publishing houses to come up with a book on KM in development that we could launch as part of their own series, maybe with the KM4Dev community or the agricultural and rural development community. If they see this as corporate social responsibility we’d be fine with it. There was also an IDRC / SAGE publication (in India) about ‘transforming knowledge’ (2011). It’s a good reader in terms of how all the components fit together, from the perspective of how results of research are being translated out there. I would’ve liked to see something similar but looking at KM more broadly. Finally, ‘Here comes everybody: the power of organising without organisations’ (by Clay Shirky): I like his analysis and with this you wonder how KM fits in the innovation systems. Personally I’ve followed systems thinking since I have been exposed to it and I’m applying it in my life. This entry was posted in Complexity, Information management, Interview and tagged CIARD, CTA, Information management, information systems, knowledge management, knowledge sharing, SADC, systems thinking by Ewen Le Borgne. Bookmark the permalink.